PHNOM PENH - Cambodian Prime Minister Hun Sen said on Tuesday he would not withdraw troops and artillery from a disputed 900-year-old temple on the Thai border until Thailand started to pull back its forces. "It is a matter of when the Thais remove their troops," Hun Sen, who won another five years in power with a landslide election victory at the weekend, told reporters at Phnom Penh's Foreign Ministry. The two southeast Asian nations' foreign ministers agreed on Monday to resolve the spat peacefully and scale back a two-week military build-up around the Preah Vihear ruins, awarded to Cambodia in 1962 by the International Court of Justice, a ruling that has rankled in Thailand ever since. However, Thailand's cabinet, which is reeling from court decisions against several ministers and a long-running street campaign to remove it from power, issued no directives to the military after a weekly meeting on Tuesday. Army chief Anupong Paochinda told reporters he was waiting for a government order to pull out the troops after both sides agreed to "redeploy" out of the disputed area on the jungle-clad escarpment that forms the natural border. "When the government says withdraw, we will immediately do so," Anupong said. Hun Sen's election victory means he does not have to pander to a nationalist clamor to tough it out with Cambodia's larger neighbor, although the wily former Khmer Rouge guerrilla has little to gain by being seen as the first to blink. The Thai government faces similar nationalist pressures and is in a considerably weaker position at home than Hun Sen. 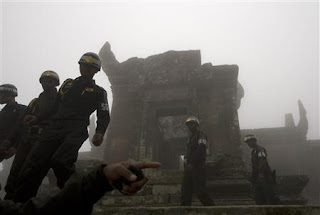 The spat first started when anti-government protesters in Thailand seized on Bangkok's backing for Cambodia's bid to have Preah Vihear listed as a World Heritage site, whipping up a nationalist fervor in Thailand. Monday's 12 hours of talks in the Cambodian resort town of Siem Reap helped relieved fears of a military clash. "If they pull out, we will do, too," Cambodia's military commander on the scene, Chea Mon, told Reporters. "But this is our pagoda. We should not move far from this area." Even if they manage to avoid direct conflict, the saga is unlikely to die down quickly as ancient temples are among the most potent symbols of national pride in both countries.